Inspector Matthew Lawson is investigating and was assisted by Sgt. Brandon Goodman. 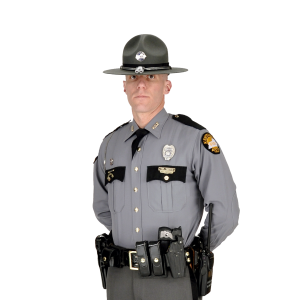 Henderson, KY (April 10, 2019) Kentucky State Police arrested a Georgia man for receiving stolen property at the Henderson Scale Facility yesterday at 9:28a.m. CT. Preliminary investigation indicates 39 year-old Teteraran Thompson of Conyers, GA was operating a semi-truck through the Henderson Scale Facility when he was stopped for a random inspection. During the inspection it was discovered the trailer Thompson was pulling a 2016 Fontaine flatbed had no trailer registration plate. Inspector Matthew Lawson was unable to find the vehicle identification plate had been removed. Once the trailer was identified it was discovered the trailer had been stolen from Smyrna, GA.